Don't be taken in by the image of potato chips and hamburgers. See how American actually measures around the world and which states are the thinnest. One stop source to the truth. Here's the buzz like it just happened yesterday. In fact, most people who've gain weight feel the same way about they're diet. How did this happen to me? Nobody knows best but you. Accepting the truth for what it is the first step on the right path. 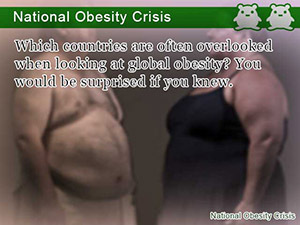 Global obesity is thought to be an issue closing in on global warming. Why is that so?You may be asking at this point. Frankly speaking, which is going to bring an end first is not that hard a question to answer. I'd like to point out that this newly news article isn't trying to point any fingers here, we are just laying down the facts like they stand on the table. It turns out that the numbers are not as bad as you've been made to believe. Here's how we measure up against around the globe. In your country when facing the problems of metabolic syndrome and obesity, there becomes a general conscientious that we should all lose weight and take measures toward improved health. Not bordering nationality, it is common that the degrees in which obesity rates have increased are often overlooked by many people. Let's see how your country holds out when compared with others. In addition, this column will take a breath look at the state of America, showing obesity rates for each state. How does your home state fair with its neighbors? Here are the obesity rates reported by countries participating in the Organisation for Economic Co-operation and Development, OECD. The list of countries participating in the OECD is not all inclusive, so for a more complete analysis please refer to the table including non-OECD countries. Let's see how well you country holds out against others. Amongst countries participating in the OECD listed high in obesity, including the US and Mexico, countries that have been under former colonial rule by the UK and Spain show higher rates of obesity; while Japan and the Republic of Korea are listed at the top of the list for countries with low obesity rates. Amongst this list of countries the US comes out as number 1. This helps support the popular image that Americans eat to much junk food. However, as you might not be aware of, the US doesn't make the next list we are going to show, obesity rates including non-OECD countries. For non-OECD countries, obesity rates are listed in the table below. Note that the data is out-of-date when compared with the above table and may contain different values listen than above. However, take in mind that next table is representative of the time. Unlike the inter-OECD obesity rate table, this table only features data for men. The reason for this is that when compared with the data for females, there wasn't much change in overall ranking. Between Nauru (Male: 72.1%, Female: 77.3%) and the country listed 2nd, the Cook Islands, there is a noticeable drop in obesity rates. This is surprise because of the fact that Nauru amongst being the country with the highest obesity rates is also the 3rd smallest country in the world, right behind Monaco and the Vatican, with a population of only about ten thousand people. Up until the end of the 20th century Nauru economy prospered by mining phosphate. However with cease activity in its mining industry, the population of Nauru's unemployment rate is said to be as high as 90%. While their country continues to provide free medical, education, and monthly stipends, it is easy to see how the people of Nauru have topped the world's charts on obesity. What may have amazed you is that although the US when compared to other OECD-counties was number 1 in terms of obesity rate; However, the compared to non-OECD counties it did not even make the rankings. Next, let's take a state-by-state look at obesity in the US. What you see may surprise you. Although amongst countries around the world, America helps set the bar for higher obesity rates; however how does this hold out when looked at state-by-state. Amongst states wit lower obesity rates are also states that have lower populations. With the exception of Connecticut and Washington D.C, these states are known to have low population densities all ranking within the top ten in the US. What this tells us is that the states having lower obesity rates, because of their low population numbers have less of an impact on the obesity rate of the US as a whole. It wouldn't be surprising to find out that people from states with lower population density are less likely to become obese. By comparing obesity rate data with state-by-state per capita income, there appeared to be a correlation between the two. For states with high obesity rates, trends show that states belonging to the South have the highest obesity rates in the US. The South has a long-lived tradition and passion for deep fried foods, such as chicken fried stake, fried catfish, and mud pie. Although it might seem that this be the most probable cause for obesity in Mississippi; however there is more. Along with being related to the various foods eaten in different regions, there are strong indications that suggest that states with lower per capita income have higher rates of obesity. This makes sense when looking at the states with the top 5 obesity rates in the US, with which Mississippi is listed as the state with the lowest per capita income in the US. This just goes to show that it is not necessarily the case that all people in the US are obese, despite what its image, junk food, tells you. That is why, no matter what sort of image your country may have, it is important that you help set the trend, dieting and getting the slim body you want while at the beach. What diet trends are happening throughout the world? See how people all around the globe are eating better to fight of the obesity. The may be surprised what you see. Childhood obesity is a global epidemic. While others are receiving the fat letter to send their kids to fat camp, here is how you deal with it like an adult. Don’t be too hard on yourself. It may not be your fault that you are overweight. It turns out that there are more people that you know that have what is called the obesity gene. Here are tips to find your inner anti-obesity. Genetics or not fate. The fat in your genes don’t make or break your diet. Even though you have an obesity gene there is hope; but not the same can be said about how parents raise their kids. 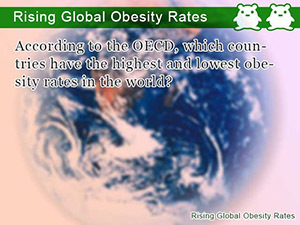 According to the OECD, which countries have the highest and lowest obesity rates in the world? Which countries are often overlooked when looking at global obesity? You would be surprised if you knew. 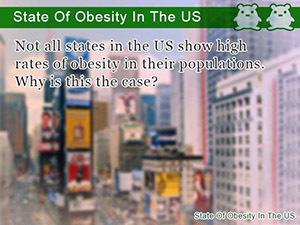 Not all states in the US show high rates of obesity in their populations. Why is this the case?